Sometimes we buy things for no specific reason just to find out, after a while, that it's something we really like. This is what happened with this recording; a CD that I bought many years ago in the shop "La Stanza della Musica" of my good and lamented friend Paola Majno. I bought Volume III, the one I have chosen for this listening, and completed the series only afterwards. 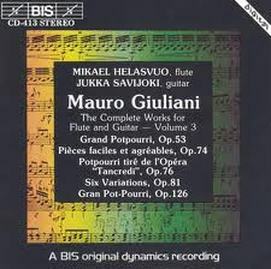 The CD that has catalogue number 413 and is still in the catalogue of the Swedish BIS, comprises all of Mauro Giuliani compositions. Mauro Giuliani lived between the XVIII and XIX century and is known for his guitar concerts that found stardom in the execution of the Romeros with the Saint Martin In the Field Academy directed by Neville Merriner. In this record, compositions are played by Jukka Savijoki and Mikael Helasvuo with the poise that these music should have. Pleasant is the adjective that crossed my mind while listening. Pleasant the sound, pleasant the rhythm that is cantabile, soft, and lulls you with its melody. Mind that if you want to sing Di Tanti Palpiti in the Grand Putpourri of Tancredi you might not be able to follow because it's abridged. The repeat is of a very high standard (I might say absolute, very suitable also for testing the instruments timbre) and helps to rebuild the event. I find especially notable the repeat of the flute that modifies its timbre and also its spatial collocation depending on the notes it is playing. The lower the notes the more hoarse is the sound and exact the collocation; the more acute are the notes the more the sound is in the air and results also very limpid. This is one of those records I could take with me on a desert island. Simple music with no useless frills to hide God knows which message, a wonderful execution that elates its easy spirit. It's a music that can be listened to at any time and very often late at night like a soft background while sipping a good Cognac.